Surrounded by turquoise waters and sandy white beaches, the British Territory and volcanic island of Ascension is named after the day of its recorded discovery. This remote destination was initially discovered by the Portuguese seafarer, Joao da Nova Castelia in 1501, only for Alphonse d'Albuquerque to rediscover it two years later on Ascension Day. Most visitors head to the capital Georgetown, one of the island's five main settlements and home to a handful of pubs - each with its own peculiar opening and closing times. A small Catholic church and the remains of a mosque that served Muslims from West Africa in the early days of occupation feature among the town's historic sites. Nature lovers who visit between January and May will enjoy seeing green turtles on the island's beaches, as the creatures come ashore to lay their eggs. Indeed, turtle tracks accent the coastline beautifully. Golf, scuba diving and open-ocean fishing for tuna, marlin and sailfish complete an exciting list of activities, meaning tourists will have plenty to do. Visitors can also explore the arid island's 44 dormant volcanic craters and its soft centre, the latter experience offered courtesy of the Green Mountain National Park. As its name suggests, the park surrounds Green Mountain and is home to historic walking trails, all of which provide panoramic views of Ascension. 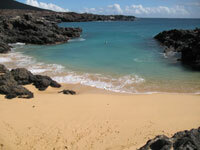 We are looking for contributors for our Ascension Island travel guide. If you are a local, a regular traveller to Ascension Island or a travel professional with time to contribute and answer occasional forum questions, please contact us.